Castor & Pollux makes the best organic puppy food of 2019. It's a healthy choice to help your puppy grow big and strong. Read more about ﻿﻿t﻿﻿he ﻿﻿﻿﻿Organix Puppy Recipe below. Here at ReadySetDogs, we love the idea of going organic. It’s great for you, your pets, and the environment. In our opinion, it’s the way of the future. Unfortunately, there just aren’t a lot of options when it comes to organic puppy food. In the past, the guidelines for using the term “organic” when describing pet food were very loose. That’s why it’s important that you look for the USDA Organic label on the packaging. Then you are guaranteed that the same guidelines for human food labeled “organic” are being followed. In contrast, the word “natural” doesn’t mean anything. There are no rules for what ingredients you can call “natural” and those you cannot. That doesn’t mean “natural” is a word to be avoided. Many companies use it because it can help communicate that the product they are selling contains quality ingredients. So it is important that you do the research on the company. Are they reputable? Do they use high-quality ingredients? Do they have any blemishes in their past? Blemishes can be anything from poor customer service to recalls of contaminated food. We like to look at customer service because if a company really cares about the wellbeing of your puppy, they will put in the time and effort to take care of their customers concerns. And if they have a number of recalls of their products, it may be reasonable to assume some part of their process is substandard. Now let’s talk about what USDA organic means. For a product to have a USDA organic seal, it must fall into one of two categories. The first is if they claim the product is “organic,” then it must be made up of at least 95% organic ingredients, not including added water or salt. Also, it must identify in the ingredient list each organic ingredient as “organic” when other labeling is shown. The second is if they want to claim the product is “100% organic,” then it 100% of the ingredients must be organically produced, not including added water and salt. A third option is that the company can claim their product is “made with organic ingredients” or something analogous. In this case, the product must be made up of at least 70% organic ingredients, not including added water or salt. They also must identify in the ingredient list each organic ingredient as “organic.” But they cannot use the USDA organic seal (except to display the seals of the agents certifying that they are including organic ingredients). 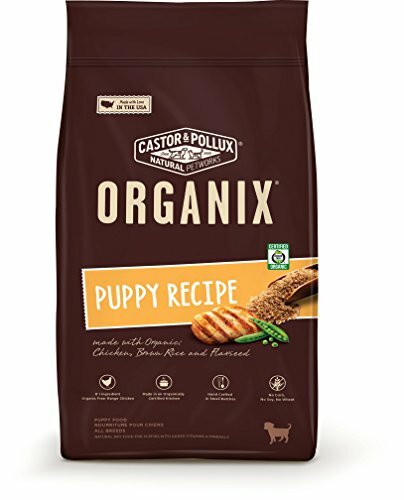 As for the best organic puppy food, we are fans of Castor & Pollux Organix line. It’s dry food with the USDA organic label. It’s not 100% organic because, at the moment, it’s not possible for dry puppy food. This is due to the fact that the vitamin and mineral supplements that must be included, according to AAFCO regulations, cannot be organically produced. So in this case, they use at least 95% organic ingredients. When choosing the right puppy food brand for your new furry little member of the family, it's most important to look at the percent protein, the percent fat, the percent fiber, the calories, and the ingredients. Below, we'll talk more about why these criteria are more important. (26% minimum Protein, 12% minimum Fat, 3.5% maximum Fiber, 3488 kcal/kg) The main ingredients include organic chicken, chicken meal, organic peas, organic barley, organic brown rice, organic millet, and chicken fat (preserved with mixed tocopherols). Reasons why we chose these data are: proteins and fats are important for the healthy growth of a puppy; too much fiber is harsh on the digestive tract; keeping track of the calories is a good way to help prevent overfeeding or underfeeding your puppy; and it’s important to know the bulk of what your puppy will be ingesting, which are the main ingredients. Keep in mind, this recipe is best for small breed and medium breed puppies. Large breed puppies grow differently and therefore have different nutritional needs. Castor & Pollux do not make a puppy food specific to large breed puppies. To learn more about large breed puppy food, please see this post. Castor & Pollux also have an endearing story. It all started with a lab/pointer mix puppy they rescued from the humane society named Joey. He was so cute and lovable, his human parents Shelley Gunton and Brian Connolly decided to start their own pet food business to keep him satisfied and healthy. Over the past 20 years, they have always been looking for better quality ingredients because they believe that pets are part of the family and deserve the best. They have a team of experts in animal nutrition, organic and natural ingredients, processing, packaging, distribution, veterinary medicine, technology and loving pets. They eventually ended up going organic. They are dedicated to providing the best organic dog food for puppies and adult dogs. While it truly is incredible that Castor & Pollux have gone organic, there are other great brands that also use quality ingredients. You can find them on our post about the best puppy food. There you will also find a great deal of information about different nutritional choices for your puppy. And remember, at ReadySetDogs, we are committed to helping you provide the best care possible for your puppy. If you have any questions, please feel free to contact us and we’d be happy to answer them.